Artworks is celebrating its 20th Anniversary! To celebrate our 20th year, Artworks is joining the Bury St Edmunds Festival with a special taster exhibition at the Guildhall in Bury St Edmunds. We warmly invite you to attend the preview evening at the Guildhall on Thursday 23rd May 2019, 6pm to 8pm. The Guildhall art exhibition is open 10.30am to 6pm from Friday 24th May to Wednesday 29th May 2019. Free entry. Val Armstrong • Lyn Aylward • Hazel Bradshaw Susan Caddy • Alfie Carpenter • Nicola Coe • Elizabeth Cooke • Gillian Crossley-Holland • Cathy D’Arcy • Helen Dougall • Fiona Fawcett • Chris Gamble • Roger Gamble • Judith Glover • Julia Groves • Chris Hann • Alison Jones • Eleonora Knowland • Lucy Lutyens • Christine McKechnie • Katie Millard • Carol Pask Anne Paton • Kit Price Moss • Eileen Revett • Zoe Rubens. Artworks, a co-operative of thirty East Anglian artists, is celebrating its 20th anniversary by joining the Bury St Edmunds Festival. The Artworks group is comprised of professional 2D and 3D artists, and their work ranges from colourful abstract art to exquisite botanical illustrations, dramatic landscape paintings to heart-rending portraiture, robust ceramics to delicate figurative works, contemporary glass sculpture to intricate mixed media constructions. Artworks in Bury St. Edmunds, The Guildhall, Guildhall Street, Bury St. Edmunds, Suffolk IP33 1PR Friday 24th to Wednesday 29th May 10.30am to 6.00pm. The Artworks 20th Annual Exhibition at Blackthorpe Barn opens on Saturday 21st September, open daily to Sunday 6th October 2019. Free entry and parking. During the exhibition, there will be opportunities to meet the artists, engage in workshops and visit the Artworks shop selling smaller artworks and artists cards. This entry was posted in artworks news and tagged exhibition, suffolk, bury st edmunds on April 20, 2019 by admin. I am extremely lucky: I live within the sacred places I have found or visit them annually. Of course there are millions of them throughout the world, but these do it for me, and I have to be coerced to seek out others. Firstly I wake up each day and through my window is the ever changing view of a Suffolk meadow. The resident barn owl might be flying round. I look to see the strength of the wind blowing in the trees, and from the sky what the day might be like. I live in a typical pink, painted, timber framed, thatched Suffolk cottage set in a garden, with humpy clipped hedges like sculptures, veg. plots surrounded in rabbit netting, outdoor rooms with sitting places. In spring there are the aconites then snow drops in drifts, blue anemones, blue bells, primroses, and cowslips, roses in Summer covering my studio, hollyhocks, fox gloves, poppies, daisies, lillies ferns, and hostas to name a few. Then in autumn the trees are laden with fruit, apples, pears, plums, and quinces, some of those I give to my local favorite restaurant. And of course outside my cottage, studio and garden is good old Suffolk – its patchwork of hedged corn fields, copses of trees, individual great oaks, the huge skies, and crumbly coast line. Another place sacred to me is Glyndebourne, and the chalk cliffs of the Sussex coast. Opera to me is singing pictures, and it seems to me that for an experience of perfection a visit to Glyndebourne can contain it all. I also love the Lake District, the ideal 19thC romantic landscape, its rugged personable skyline, its bleak fells, its lush meadows and woods, its tinkling streams, and gushing water falls, and finally broad placid expanses of water, there shapes etched in my memory. Lastly if I go abroad I like to go to Italy – Venice preferred; a palazzo apartment in the Arsenale district. I have been going there for some years – I love the quiet, the play of sunlight on the canals, the pattern and textures of the building, local shopping, the friendliness of Venetians, living with Donatello, Carpaccio, and Palladio close by, the contrasting thrill of the lagoon – a huge expanse of threatening yet some how benign water. See more of Christine McKechnie’s work on her website. 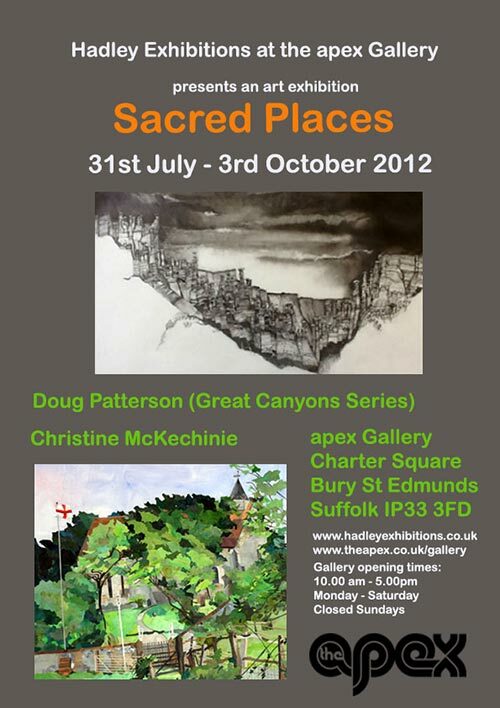 This entry was posted in artworks news and tagged apex, bury st edmunds, christine mckechnie, doug patterson, exhibition, sacred places on July 31, 2012 by admin. The Artworks blog are pleased to inform you that Christine McKechnie is having a solo exhibition of her collages by kind permission of the Dean and Chapter at the Edmund Gallery, St Edmundsbury Cathedral, Bury St Edmunds, Suffolk, from Saturday 13th November to Wednesday 17th November 2011. Christine McKechnie is a well-known collage artist who uses watercolour painted papers, which are cut into intricate shapes and pasted onto board in many layers, using many hundreds of pieces. See this example of her work below. Christine’s wonderfully detailed collages mostly depict the many places she has visited, including Egypt, Hong Kong, Morocco, and Italy (especially Venice), as well as the countryside of Suffolk. 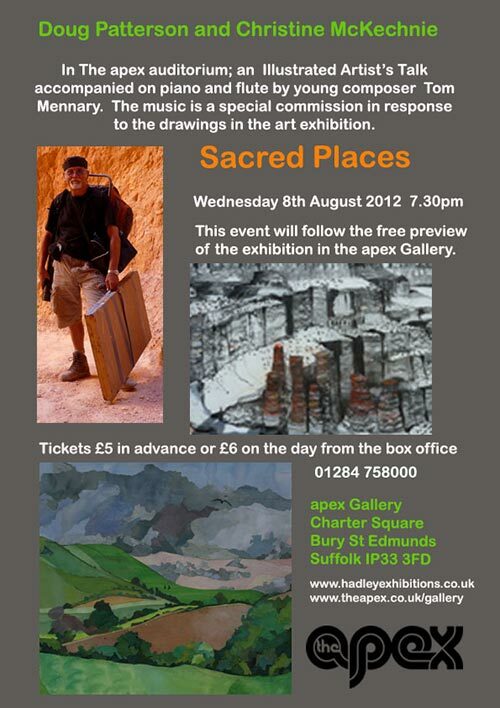 If you are intrigued by the artform of collage why not go along and see the exhibition. You can also have a go at making some collage yourself as Christine will be giving collage demonstrations and tuition throughout the exhibition at the Edmund Gallery. Christine has had a busy year in 2011, starting with a solo exhibition at the Chelsea Arts Club in London. 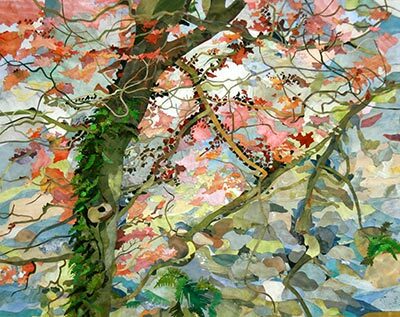 She was also one of the featured artists at the Glyndebourne Opera Season showing new collage works depicting in the South Downs landscape. 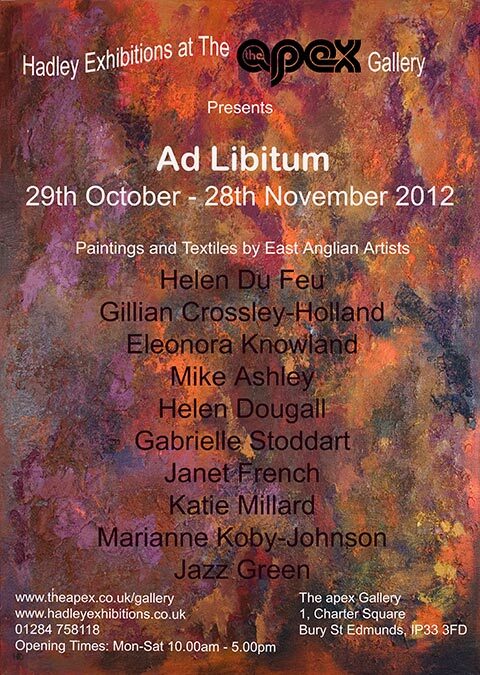 She also participated in Suffolk Open Studios 2011, and most recently exhibited at Blackthorpe Barn in the Artworks 12th annual exhibition in September 2011. Christine McKechnie trained at Southampton and Kingston Schools of Art. She has been a regular exhibitor at the Royal Academy Summer exhibition. She has also been involved in art projects with local schools in addition to other artist demonstrations and workshops. She is also a regular contributor to The Artist & Leisure Painter magazines. 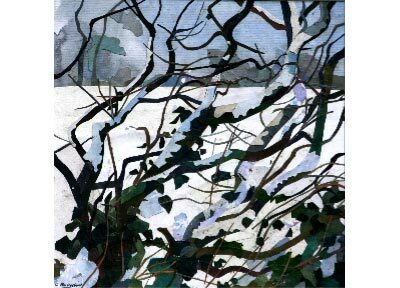 You can see more of Christine McKechnie’s collages on her own website, christine mckechnie.co.uk. 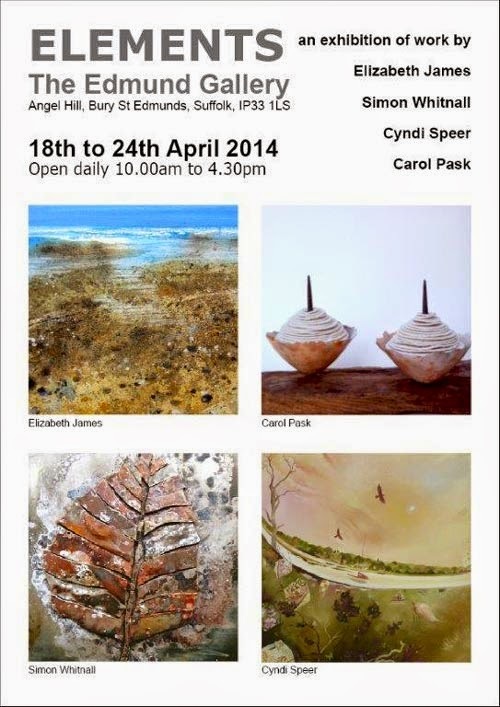 We wish Christine much success with her new exhibition! This entry was posted in artworks news and tagged bury st edmunds, christine mckechnie, collage, edmund gallery, exhibition, landscapes, suffolk on October 20, 2011 by admin.